At the Ta Prohm temple at Angkor Wat in Cambodia, there is a small but famous image carved onto a pillar. 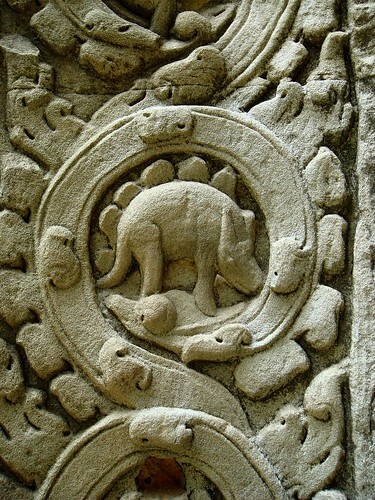 Within a line of decorative animals encircled by intricate designs of vines, there appears a creature which looks very much like a stegosaurus - a large lizard with a row of plates down its back. This temple was built in the 1180s, which is relatively recent compared to the dinosaur age. Stegosaurs became extinct 75 million years before these carvings were completed, right? So, what's going on here? Were the Angkorians dabbling in paleontology, were there really dinosaur-like beasts in the Cambodian jungle only 800 years ago or is this some other animal that happens to have been carved to look like a different distinctive animal? Google 'Angkor Wat' and 'dinosaur' for some *ahem* interesting theories. Smithsonian Magazine did a write-up on the maybe-dino. A close look at the larger stone slab in situ indicates that this critter is unlikely to be a recent addition or alteration unless the entire column is a modern reconstruction. Some have suggested that it's not a dinosaur but some other large animal standing in front of a tree. Note that none of the other animals shown in this frieze are in front of trees but that doesn't prove anything. I personally believe it's a very wonky buffalo or a chameleon, but it's fun to let one's imagination run wild with fantasies about Khmer Empire dinosaurs. ETA: Check out this *cringe* Bible.ca post for photos of the rest of the animals carved on the column. Too bad the end of the tail isn't visible, we would be able to see if there are spikes!